Johanna Finger, born 23rd of August 1860 in Nekmir house number 1, near Vseruby, north of Plzen, in Bohemia - today the Czech Republic but then part of the Hapsburg Empire. Her parents were Dominik Finger, innkeeper in Nekmir, and Franziska Michel. Dominik's mother was Appolonia Simoni of Mirotice, and Franziska's father was Anton Michel of Krasovice. In western Bohemia I have found many German names, so it is not surprising to find the name Finger there just as it is in Germany. We added another Finger line to the site, John Finger who was born in Bohemia and came to the U.S. in 1872. We were pleased to receive this postcard picture from Cheryl Morrison. 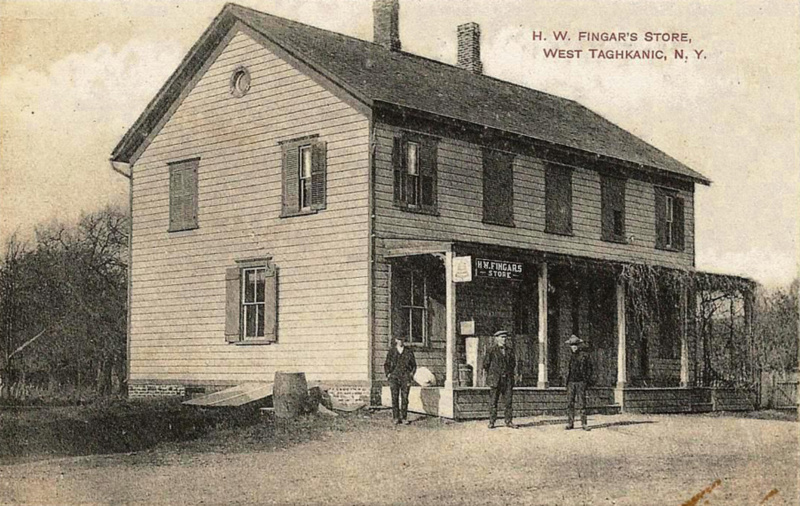 This is the store of Harry William Fingar taken about 1910. On the 1910 census Harry is age 35 and listed as merchant, general store. While most of the U.S. has been having cold and snowy weather, the weather in Sacramento has been unusually warm (in the 60s and 70s) but without the usual rain for this time of year. The governor has declared a drought, and we have been asked to cut back our water use by 20%. The information from January 6, mentioned below. Linda Sue Finger sent some corrected information concerning the wives and children of Donald Craig Finger. Seems we had the children with the wrong wife! Added information about the Hochmuth family. This comes to us from Rae Miller. Harold Hochmuth (b.1861) married Catharine Finger. Additional descendant information for William Finger from Robert Finger. We now enter another year of Finger Family news. I have changed the format of the NewsPage to match the recent changes to other documents.